Something needs to be done about server 7. My main account is on there and after every update more and more people quit the game. Recruiting has become nearly impossible now. Having to leave inactives in guilds just so there isn’t a loss in war defences. Is there a possibility of a merge in the near future? That is totally right s7 keep dying and dying. They’re ignoring the server for whatever reason. 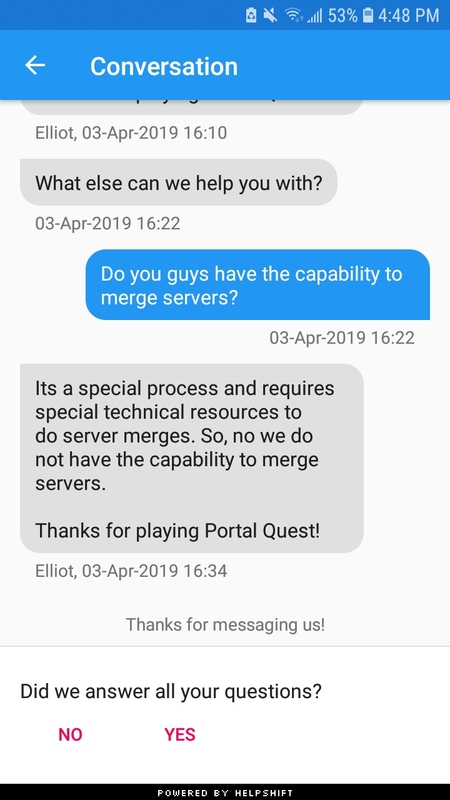 Here’s what @Elliott sent to me when I asked about a server merge like look at this. I agree with the need to merge servers. So many of us have put a fair amount of money into this game. Letting this server die out will be detrimental to Per Blue. You will end up losing a large amount of players that are willing to spend money because they aren’t going to want to start all over again on a new server. We do have the ability to merge servers, as we’ve done it in the past, but we do not have immediate plans to do more merges. We aren’t letting any server die, or waste away. We aren’t neglecting server 7. We have many, many data points that we monitor to keep track of server health and stability and server 7 is fine. Every update or color increase I’ve noticed more people drop off and quit. A server merge will be necessary soon. If no merge occurs then something to help increase new player acquisition on to 7 is needed along with mechanisms to get those new players up to speed. Server three was declared in crisis when there were around 50 or 60 warring guilds. I appreciate there are more metrics than that. But server seven has 48. Would hate to see another mad scramble to elevate players to the same level as the next server up. But if a sensibly paced slow down / speed up doesn’t happen pretty soon, it’ll be crisis point all over again. Full disclosure: I don’t have a server seven account. 48 warring guilds is fine? With the amount of players dropping each day? Pleaser merge srver 7 and 8. Please. Server 8 is slowly dying too, it is extremely difficult to recruit. Top guilds have had trouble recruiting lately on s7. Youd think they wouldnt have an issue seeing as people wanna be in a top guild. But there just isn’t the players there anymore. I get merging servers isnt a simple task btw. But alot of us spend alot on this game and it is kinda wasted when even the top guilds start struggling because there aren’t enough active players. There are always guild merges. Merging 2 guilds into 1 is tough for obvious reasons, but there’s the option of merging 3 guilds into 2 or even 4 into 3. It’s inevitable that the number of people leaving will be greater than the number of people joining, so some guild needs to just bite the bullet. 7 isn’t the only Server losing more people faster than new ones join. Slow down with those updates and give the newer players some hope of catching up. And please stop adding more gachas and gimmicks. This latest craze with “cosmetics” is just one distraction too many.